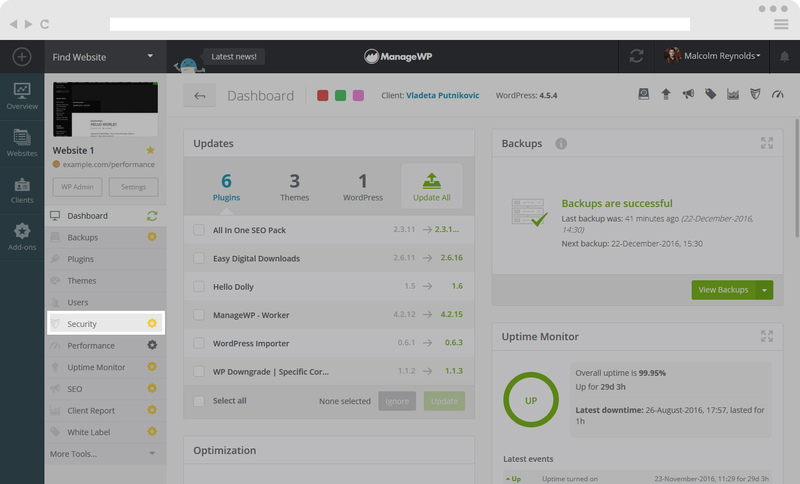 ManageWP uses Sucuri’s SiteCheck tools to scan your website. Sucuri provides web-based integrity monitoring and malware scanning of your website. It may be the case that your website is infected with malware or spam and you know nothing about it. 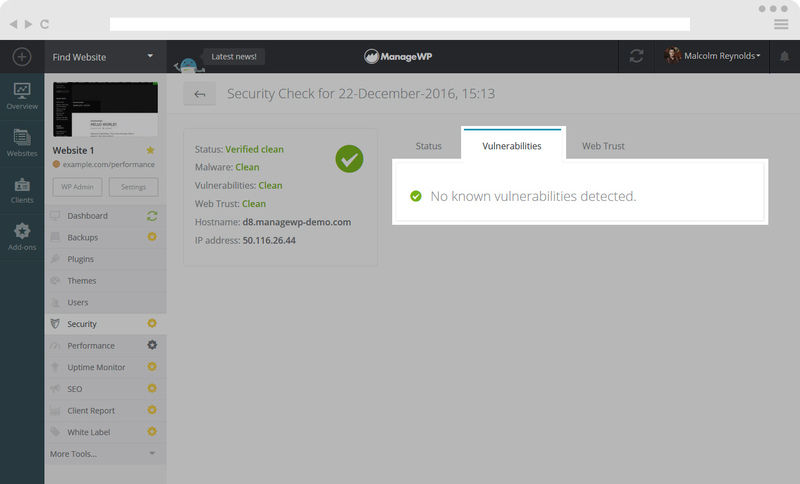 Thankfully, you can quickly scan your website from your ManageWP dashboard and be aware of your website security. Security Check tool comes in two versions, free and premium. In order to find your Website Security Tool, click on the website you wish to run a security check on. On the left hand side you will see a list of options, here find Security and click on it. Click activate button and you will be able to choose between the free and premium version. Here you can run a Security check and you can also see the security checks you did so far and when did you do them. Choose the security check you need and click on the View Details button to see the details of that security check. When you have found your Security Tool for the website, you will see a green button – click on Check Now. As seen below, you will receive a detailed description of your website’s security. Here you will be able to find out if your website is infected or not. You can also click on the Vulnerabilities and Web Trust to get more information about the security of your website. The premium version comes with Automated Security Checks. 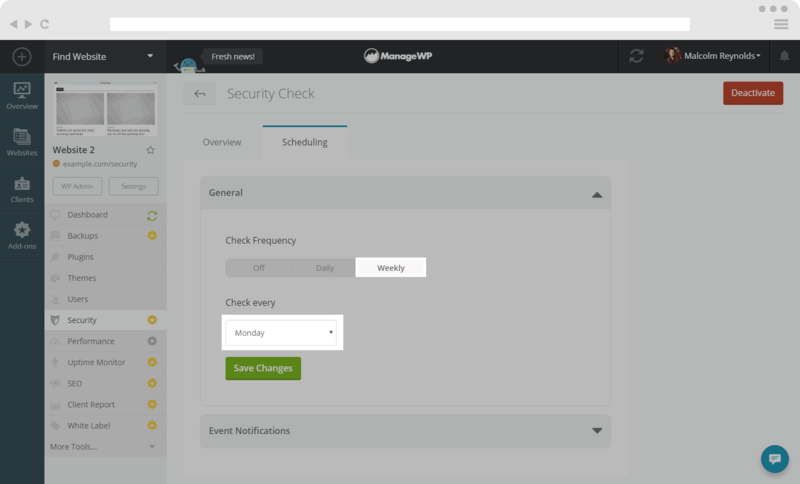 Click on the Scheduling tab in order to set the frequency of your Security Checks. 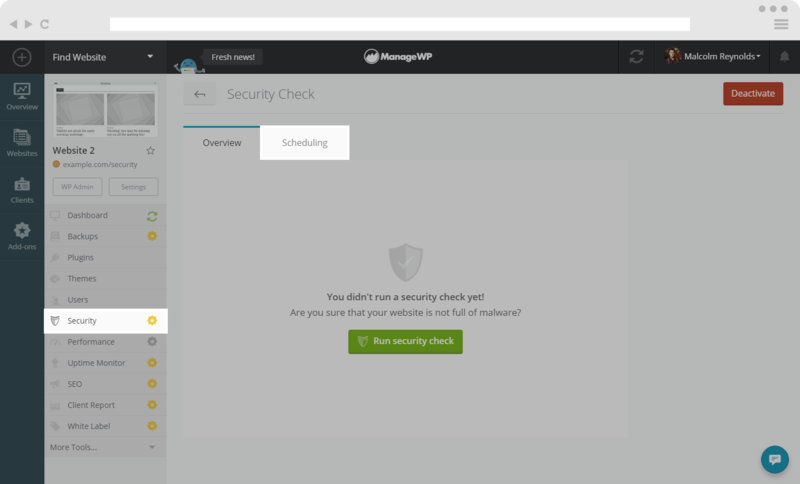 Under General tab, you will be able to choose between Daily and Weekly Security Checks. If you choose Weekly Security Checks, you will be able to see a drop-down list where you can select a preferred day of the week for your Security Checks. 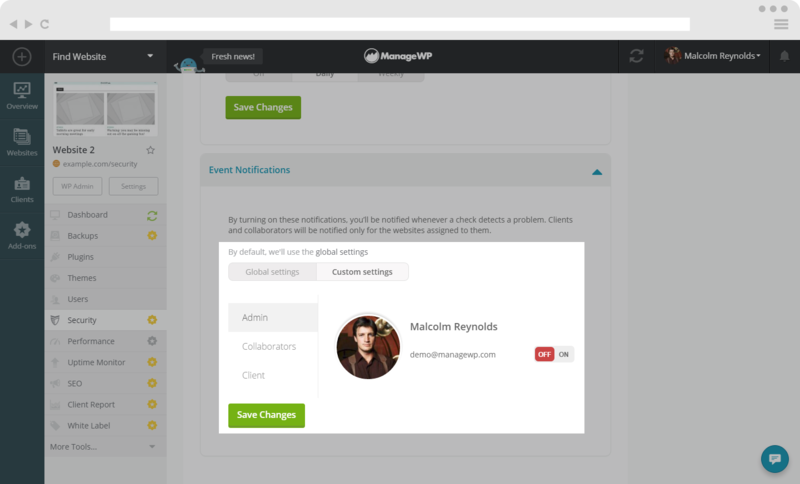 Under the Event Notifications tab, you are able to turn on email or slack notifications that could be sent to you, your Collaborators and your Clients. 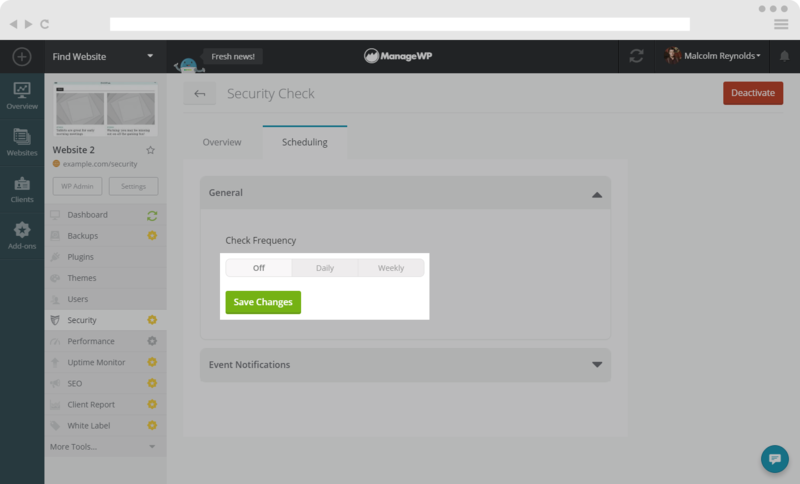 You could also turn on Event Notifications for the Security Check by clicking on your login details in the top-right corner and clicking on the Settings button. 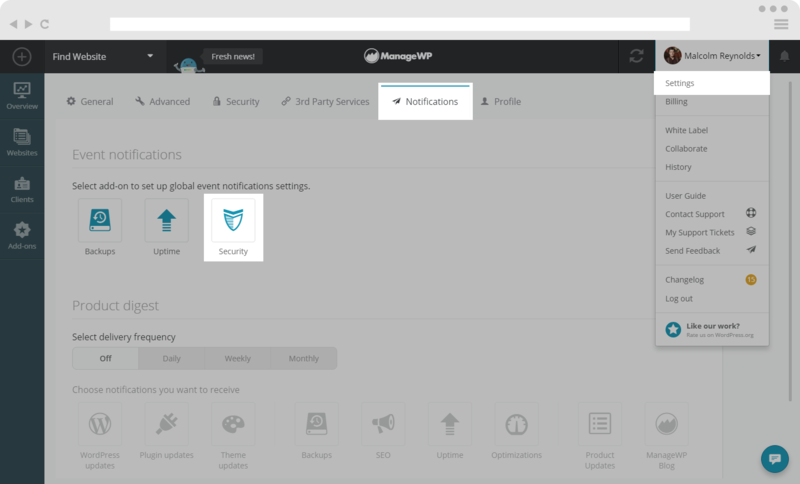 After that, navigate to the Notifications tab and click on the Security icon under Event Notifications. 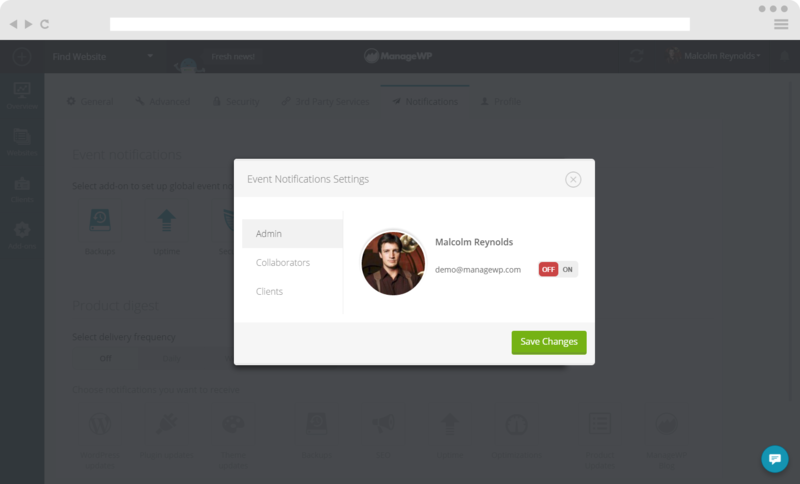 Turn on Security Notifications for you, your Collaborator or your Clients.